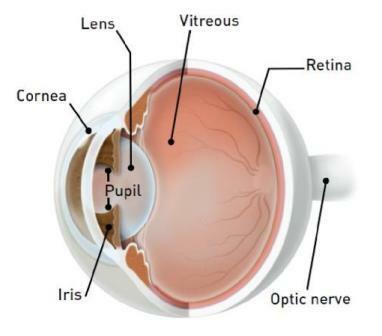 The retina is a nerve layer at the back of your eye that senses light and sends images to your brain. An eye is like a camera the lens in the front of the eye focuses light onto the retina. You can think of the retina as the film that lines the back of a camera. A clear gel called vitreous fills the middle of the eye. As we get older, the vitreous may pull away from its attachment to the retina at the back of the eye. Usually the vitreous separates from the retina without causing problems. But sometimes the vitreous pulls hard enough to tear the retina in one or more places. Fluid may pass through the retinal tear, lifting the retina off the back of the eye, much as wallpaper can peel off a wall. · A gray curtain moving across your field of vision. 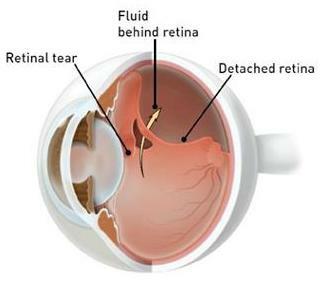 These symptoms do not always mean a retinal detachment is present; however, you should see Dr. Landa as soon as possible. Dr. Landa can diagnose a retinal detachment during an eye examination and will dilate (enlarge) the pupils of your eyes. Some retinal detachments are found during a routine eye examination. Only after careful examination can Dr. Landa tell whether a retinal tear or early retinal detachment is present. Most retinal tears need to be treated with laser surgery or cryotherapy (freezing), which seals the retina to the back wall of the eye. These treatments cause little or no discomfort and may be performed in a retina specialist’s office. Treatment usually prevents retinal detachment. After successful surgery, vision may take many months to improve and in some cases may never return fully. Unfortunately, some patients do not recover any vision. The more severe the detachment, the less vision may return. For this reason, it is very important to see Dr. Landa at the first sign of any trouble.